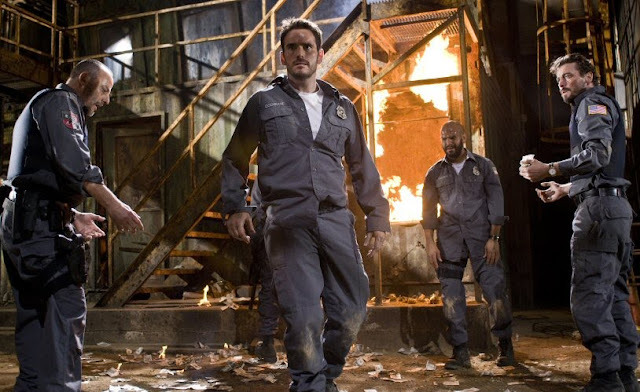 With a cast comprising the perfect collection of action B-movie usual suspects (Matt Dillon, Jean Reno, Laurence Fishburne, Amaury Nolasco, Fred Ward), you would have thought that Predators director Nimród Antal could have conjured something more successful than this rather drab take on the 'heist-gone-wrong' genre. As it is, Armored (retaining the American spelling for its UK release) doesn't turn out to be a bad film, just one lacking in any new ideas, distinct visual flourishes or, basically, a reason for you to stay awake. For those who do manage to delay their slumber, the opening to Armored is basically well crafted, seeing the majority of the above gang hijacking a security truck from the company they work for, dragging in reluctant accomplice Ty (Columbus Short) to help them out. Inevitably, things don't go to plan and it isn't long before Armored becomes a sub-par Reservoir Dogs, albeit with added genre cliches (is that a policeman coming to check if everything is OK I see?) and again, a rather bog standard examination of evil men being evil. Another of the problems that Armored faces and doesn't entirely overcome though is that these men don't really appear evil enough and certainly don't scare enough to leave you quaking in your boots. Dillon takes centre stage and yes, he's got presence and can carry off soliloquy-like dialogue but he also blots out everything else, criminally marginalising Reno and, to a lesser degree, Fishburne. In truth, as Armored develops the conflicts within the group, there are some scenes of notable tension which are well managed if a little unbelievable in terms of how they're set up. Antal's film certainly isn't a complete dud: with a cast like this, there's always something happening in the wings that at least threatens to be interesting, but the director just doesn't do enough with the gifts he's been given and produces an action film which will be forgotten as the popcorn fodder it is within minutes of the credits.